Oh wait, no it's not! Update: LG has been in touch and highlighted the availability via MobileFun is a scam. The retailer has removed the product listing from its site, and we've shed a tear that we won't be getting it anytime soon. 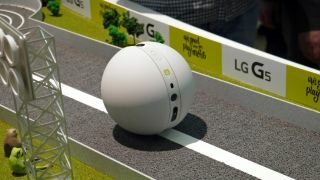 The LG Rolling Bot, a rolling surveillance camera and fun remote controlled toy, has now been confirmed for the UK. The futuristic looking Rolling Bot is a white plastic sphere with two domed wheels, complete with an 8MP camera, speaker and even a laser pointer. It's controlled from your smartphone and works with Android and iOS. This gives you the ability to check on your house remotely via your phone, as well as entertain your beloved cat with "play mode". This activates the laser pointer and sees the Rolling Bot spin around your room, allowing your moggy to chase it to its heart's content. Previously, it wasn't clear whether the Rolling Bot would be available in the UK, especially considering LG never planned to release it to the public. The LG Rolling Bot can now be pre-ordered at MobileFun for £229, with deliveries expected to roll in from August 1. While it may be a fun piece of kit, its limited practicality means many will be put off by the high asking price. Let us know what you think of the Rolling Bot in the comments below, and whether you'll be splashing the cash on LG's latest quirky tech offering.